The power of turbolasers is difficult to determine precisely. However, we can determine certain lower limits. This means that we can determine a minimum amount of power that is required for a TL to accomplish a certain task. The actual power may be much higher (note: the term "lower limit" does not mean that these figures are the least amount of power a TL can produce). This is because every object requires a specific amount of energy to reach a given temperature from a lower one. A specific amount of energy is also required to melt any object, and a higher amount is required to vaporise the object. The energy requirement is determined by the exact chemical makeup of the object in question, as well as atmospheric conditions. The term "calorie" is not to be confused with Calorie (capital C), which is generally used to describe food nutritional value. The term "Calorie" is actually a kilocalorie, or 1000 calories. A calorie is defined as the amount of heat required to raise the temperature of 1 gram of water 1 degree Celsius. Physicists usually measure energy in joules rather than calories. Power is generally measured in watts. A watt is defined as 1 joule per second. This means that 1 joule expended in a full second equals 1 watt. If it were expended over 2 seconds, it would be 1/2 watt; if 1 joule is expended over 1/3 seconds, then it is 3 watts, etc. The number of joules a weapon directs to a target determines how much work it can do. For example, to raise the temperature of the target, a certain number of joules has to be added to it. The power level is also important, as the work done on the target has to be done in a limited amount of time. If a lot of energy is added to the target over a long period of time, the heat may be radiated away before it can do any damage. If a small amount of energy is added at a very fast rate, the power level may be high, but little work will be done. Turbolasers are high energy and high power weapons. This may also help penetrate enemy shields, as the weapon's energy may be delivered faster than the shields can regenerate (even in fractions of a second). 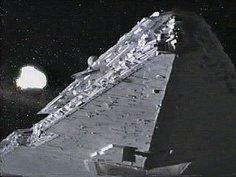 In The Empire Strikes Back, a Star Destroyer (ISD) was witnessed clearing asteroids from its path by precise TL hits. Since we can estimate the size of these asteroids, and we can safely judge the chemical makeup of the asteroids, this becomes a reasonably accurate piece of information to judge the energy delivered by these specific TL bolts. The bolts fired in the earliest asteroid-vape scene in film were mostly middle sized TL bolts (see Turbolaser Characteristics for more information about TL bolt sizes). Longer TL bolts were seen in this scenes as well, but were less frequent. The heavy dorsal turrets were never used. Note that the asteroid this large-sized TL bolt has just hit is melting (and subsequently vaporised), and the TL bolt passed through, retaining its original shape, continuing on its original course. This implies that the energy contained in this bolt is much higher than the amount required to vaporise the asteroid. The bolt is passing another asteroid (in the lower-right corner of the image) that appears in other frames as well. This allows identification of this bolt as a larger type. In this picture, an obviously middle-sized bolt is about to strike the asteroid. These asteroids were at least on the order of 20 meters in diameter. 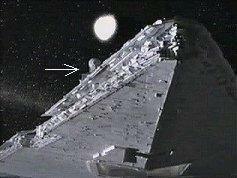 The asteroids appear to be slightly shorter than the diameter of the Millennium Falcon. 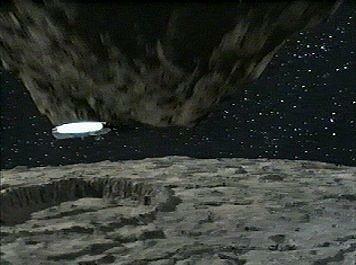 Several asteroids were also vaporised when in close proximity to the Falcon itself in later scenes by long TL bolts. 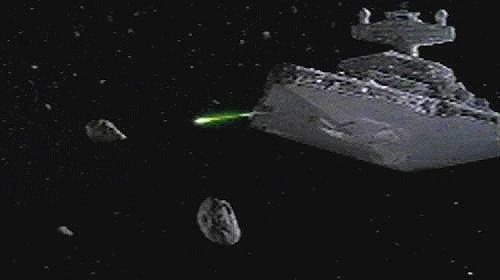 Since the ISD in pursuit would only have vaporised asteroids that were in its path, these asteroids were much closer to the Falcon than they were to the camera. The size of the Falcon is in despute, but when scaled against an ISD, it must be around 40 meters wide, and slightly longer. In these images, a 35-40 meter diameter estimate seems more appropriate. More than 90% of the asteroids studied fall into 1 of 2 composition groups: stony iron or carbonaceous. And only a few percent of the meteorites on Earth are carbonaceous. Most of the asteroids in our museums are stony iron, because the carbonaceous ones break up in the atmosphere, or are more succeptible to weathering than the iron ones. He goes on to state that he feels the asteroid in ESB are ferrous (iron) in composition, because of the observed color of the asteroids. They appear to be rusty-red, as is typical of iron. The asteroid the Falcon is passing underneath is definitely solid, and appears rusty-red, like ferrous oxide (rusted iron). The dangerous asteroid belt in the Hoth system was formed billions of years ago by the collision of two planets. Millions of boulders and rocky asteroids careen through space in orbit together, forming a deadly swarm and a menace to navigation. Entering such a field with a spacecraft would be sheer suicide. Rock actually requires more energy to melt and vaporise than does iron, because as little as 50% of the energy may be absorbed from an energy weapon, depending on the exact composition, with the rest of the energy radiated harmlessly into open space. This makes the estimations of firepower presented here conservative, since the asteroids are assumed to be 100% iron. With this we can calculate a rough figure of around 30 terajoules (TJ) to melt the asteroid, and around 250 TJ to vaporise it. The vaporisation figure has been in debate for some time. Many state that the asteroids simply broke apart under the influence of the heat: part of the asteroid may heat up faster than other parts, and expansion stress would cause the asteroid to shatter. But this event is not witnessed in the film. 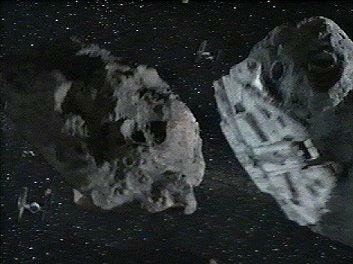 The asteroids were vaporised in the film. The asteroids turned into red-glowing liquid, and then vanished from sight within 1/4 second. 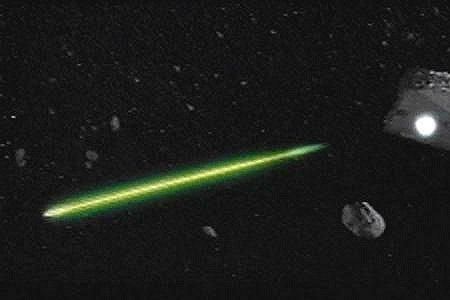 The asteroid material could not shed over 1000 degrees Celsius in a fraction of a second to eliminate the glow, as this would require an artificial mechanism as powerful as the turbolaser bolt itself. 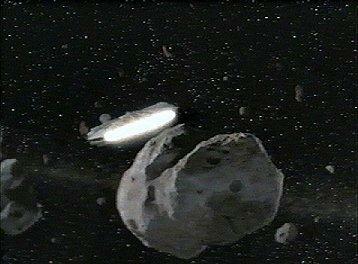 The rock must have been turned into vapor to account for the asteroids "flashing out of sight". Curtis Saxton suggests that the asteroids did not shatter because the melting/vaporization was "supersonic". This means that the asteroids were melted/vaporised before this expansion stress could take effect. This appears to be a valid theory, since the entire vaporization process took approximately 1/4 second (note from MW: this idea deserves further explanation: speed is everything. Thermal conductivity through the asteroid's mass is insufficient to account for the effects we saw, because the rock simply cannot conduct that much heat that quickly, even if it's pure iron. The effect would be more of an explosive effect, with a tiny area being superheated and a concussive shock wave moving out and shattering the asteroid. However, in order to shatter these asteroids so quickly, the fragments would have had to move through the rest of the asteroid at more than 600 m/s! This would require extremely rapid large-scale deformation of material, and the mechanics of solid material deformation happens to be an area which I've studied in depth. Deformation involves work, as defined by the stress-strain curve of the material, and that work becomes energy in the resulting deformed matter; this effect is known as work heating. The question of whether the asteroid was heated or shattered is therefore moot, because the act of shattering it at such great speed would create so much work-heating that the resulting material would be superheated anyway). It appears in this scene that the side of the asteroid facing the turbolaser bolt was vaporised, and the resulting liquid/gas then heated and vaporised the remainder of the asteroid. This suggests that the TL bolts are again much more powerful than was simply required to vaporise the asteroids. However, the boiling point is affected because the asteroids are in vacuum. The boiling point of any material is directly related to the atmospheric pressure surrounding it. In space, the atmospheric pressure is zero. However, at the same time, the asteroid vaporisation was "supersonic" which means that the TL bolts carried much more energy than is required for vaporisation. The vaporisation estimate is on the correct order of magnitude, and actually conservative. It can be used as a conservative lower limit for the power of turbolasers. The following image justifies using the figure required for melting an asteroid, as opposed to breaking up into pieces. In this image, the asteroid is partially breaking apart, but it is very apparent that the rock is melted, or at least melting. I don't understand why some argue that the asteroids simply broke apart. Within three frames (1/10 second), there was no trace of this glow. The melting/vaporisation of these asteroids took less than a second. The scene lasted about 3-4 seconds, and several asteroids were destroyed during that time. On the widescreen Special Edition, the scene lasted 130 frames. The frame rate is 30 frames per second. The asteroids required 8-9 frames to vaporise completely. Therefore, it took .225-.3 seconds for the asteroids to completely vaporise. The power of the TL bolt should be determined by the time the bolt is actually striking the asteroid, which is between 1/15 and 1/30 second (1-2 frames). If these bolts are 50 meters in length, and have a duration of 1/15 second when striking the asteroids in ESB, then they (at least the visible portion of the beam) must travel at a rate of around 750 meters per second. This velocity is comperable to that of a modern rifle bullet [my 30.06 hunting rifle fires bullets faster than this], and would take over 2 seconds to travel the length of an ISD. This is clearly not the case in the film, so the power levels presented here are again very conservative, because the TL bolt duration should be lower (in turn increasing the wattage). Therefore, if we are conservative and use the melting point (more specific figure than boiling point), and use 20 meter asteroids, with the melting figure of ~30 TJ: a medium-sized TL bolt must have in excess of 450 terawatts of firepower. When discussing a weapon, there is more than one way of expressing firepower. Turbolasers fire "bolts", so the firepower of each bolt can be measured. These bolts are only fired once per unit time, so the "sustained" firepower is the power of each bolt divided by this unit of time. These mid-sized TL bolts can be fired at least once every two seconds, so a turbolaser cannon must have a sustained firepower of at least 15 terawatts. Assuming they can be fired once per second, they would have a sustained output of at least 30 terawatts (since one of the smallest estimated diameters of the asteroids is used, and only the melting point, this estimate is ridiculously conservative). In comparison, the United States now produces 500-600 gigawatts of electrical power. This is a whole order of magnitude less than the power of a single middle-sized turbolaser. The atomic bomb that was dropped on Hiroshima was rated at 15 kilotons. This translates to about 63 terajoules. Using my conservative estimate for TL bolts (ignoring vaporisation), a middle-sized TL bolt has about 30 TJ of energy. Therefore, a TL bolt has about half the energy of the Hiroshima bomb. A bomb releases its energy in all directions, so an object immediately next to an exploding bomb won't absorb any more than half of the energy, probably much less. A TL bolt directs essentially all of it's energy to a target, therefore, a TL bolt is at least as intense as the blast from an atom bomb, even if the bomb was detonated while in contact with the target. At greater distances, the intensity of the bomb's blast decreases exponentially. A single TL bolt should have the capability to level a small town, as the Hiroshima bomb did. Of course, with the energy required to vaporise the asteroid (~250 terajoules), a turbolaser bolt must have on the order of 3750 terawatts of firepower. The energy released would be approximately 4 times more than that of the Hiroshima bomb. If the asteroids were 40 meters in diameter (and some were much larger), the TLs were directing at least 2000 TJ of energy to vaporise the asteroids, many times the conservative energy level presented above. If the amount of time the bolt is striking the asteroid is 1/15 second (2 frames), 30,000 Terawatts are delivered to the asteroid. Assuming these turbolaser cannons have a maximum firing rate of once every two seconds, they have a sustained firepower of at least 1000 terawatts. 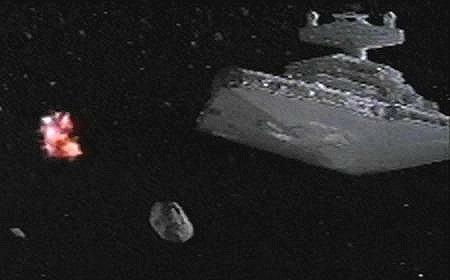 The most solid evidence that suggests 40 meter asteroids was in the Avenger-Falcon chase scene, coming out of the asteroid field. One asteroid was at least 60 meters in diameter, which would require at least 6700 terajoules to vaporise! Another asteroid in a previous scene may have been as large as 100 meters in diameter, requiring at least 31,000 terajoules to vaporise! Curtis Saxton finds that the twin globes on top of ISD bridge towers are ~43 meters in diameter. In this image, the Falcon is attached to the stern portion of one of these towers. The globe is 92 pixels in diameter. The Falcon is 93 pixels wide and 114 pixels long. By these measurements, the Falcon is ~43.5 meters wide and ~53.2 meters long. 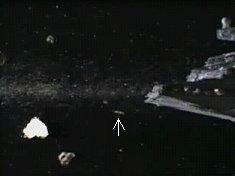 In this image, both the Falcon and the asteroid are 18 pixels in length. In the next frame, the white-hot material of the asteroid expands. 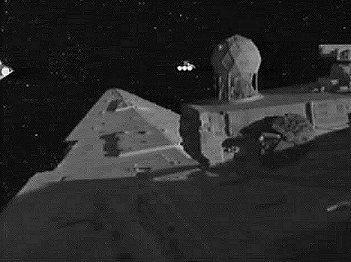 The Falcon appears to be partially visible between the camera and the white glow. 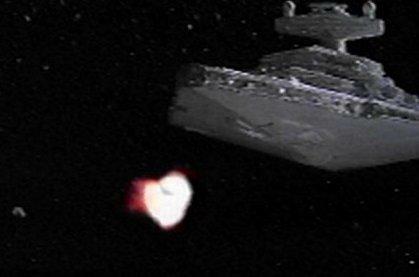 This suggests that the asteroid is slightly more distant than the Falcon. Thus, it is more than 40 meters in diameter. It would have a mass of at least 260 million kilograms, and would require at least 2000 terajoules to vaporise. The bolt carried at least 30,000 terawatts of firepower with its 1/15 second duration. This image is from the same scene, a few frames earlier. 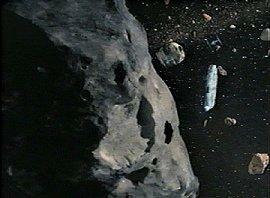 The asteroid must be in the path of the Avenger, or it would have been left untouched. Thus, it is closer to the Falcon than it is to the camera. 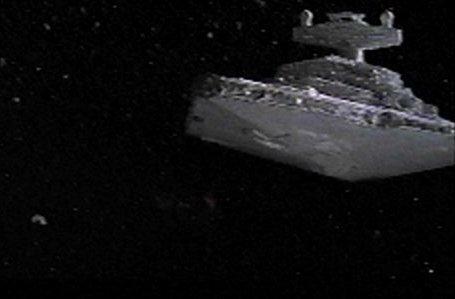 I measured it at about 24 pixels in diameter, almost exactly twice that of the Falcon at about 12. If the Falcon is 53 meters long, then the asteroid must be on the order of 100 meters in diameter. This would require over 31,000 terajoules to vaporise. If the duration of the bolt is 1/15 second, then its energy is delivered at a rate of at least 465,000 terawatts. If a more conservative Falcon length of 40 meters is used, as above, then the asteroid must be around 80 meters in diameter. It would require at least 16,000 terajoules for vaporisation. The bolt's energy would be delivered at a rate of at least 240,000 terawatts. This bolt was fired from a small cannon on the nose of the ship. When viewing the entire length of the ship, it is impossible to determine that this cannon even exists. It is likely an anti-starfighter cannon. Some would argue that the Falcon is only 26.7 meters long, as West End Games sourcebooks state. In this case, the asteroid was at least 50 meters in diameter, and required a lower limit of 3900 terajoules for vaporisation. The energy was delivered at a rate of at least 58,500 terawatts. Since these vaporisation calculations are bare-minimum, and turbolaser bolts perform this in eye-blinking time, I can say with certainty that turbolaser cannons are at least several times this powerful. If anyone wishes to debate the scaling and state that the asteroid is closer to the camera, I challenge them to watch the second asteroid scene frame-by-frame backward. The bolt was obviously traveling forward, and not in the direction of the camera to any visible degree. This is a later scene. 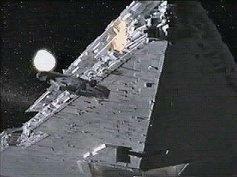 The Falcon is leaving the asteroid field, and the Star Destroyer behind is about to. 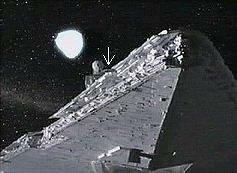 The Falcon is 18 pixels wide, and the more distant asteroid (the large-sized bolt came from the dorsal surface of the ship, and was fired in a starboard direction - not in a ventral direction) is 27 pixels in diameter. Thus, the asteroid is more than 60 meters in diameter. This asteroid would require at least 6760 terajoules to vaporise. This asteroid was vaporised as easily as any of the others. Thus, this bolt carried much more energy, probably many times more (6700 terajoules would take some time to vaporise the asteroid, this one took a fraction of a second). This can thus be set as a lower limit on the energy delivered by a long TL bolt. If the bolt's duration is 1/15 second, then it carried well over 100,000 terawatts of firepower. Given the direction this bolt was traveling, it could not have come from the heavy dorsal batteries. It had to have been fired by the ship's more mundane batteries. Falcon is 21 pixels wide, asteroid is 24. Thus, this more distant asteroid is at least 45.7 meters in diameter. This one would require at least 2900 terajoules to vaporise. The Falcon is 29 pixels wide, and the asteroid is 26 pixels wide. Thus the asteroid has a lower limit of 36 meters in diameter. Energy required for vaporisation: at least 1450 terajoules. The Falcon is 57 pixels wide, and the asteroid is 30 pixels in diameter. It is much more distant than the Falcon, and has a lower limit of 21 meters in diameter. This one would require at least 290 terajoules for vaporisation. The Falcon is 66 pixels in diameter, and the asteroid is 22 pixels in diameter, making it at least 13 meters in diameter. At least 65 terajoules would be needed to vaporise this one. The last stages of vaporisation of the asteroid in the image next door (to the left) is seen as well. Thus, the asteroids were at least 13 meters in diameter, and some were at least 60 meters in diameter, and were all vaporised in a fraction of a second by a single shot. The largest asteroid scaled here appeared to be vaporised by a long bolt, and came from an area of the ship where there are no heavy cannons. Turbolaser firepower easily exceeds 6700 terajoules per shot, even from medium-sized cannons (the heavy batteries must have much more firepower). 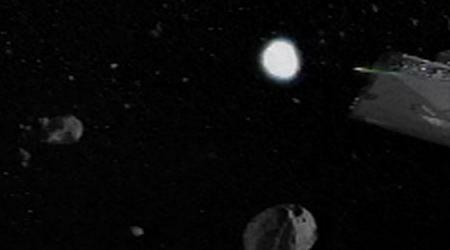 It has been debated that the asteroids were not very dense - perhaps chunks of debris. Like gravel held together by gravity. This is plainly not the case in the film. These asteroids look plenty solid to me. And large too. It is also interesting to note that, in A New Hope, the TL bolt that struck the Tantive IV had to finish off the shields first. This left only a fragment of the original bolt, and was definitely less powerful than it originally was. Yet, it still had sufficient energy to cause serious damage when it hit the hull (which may have been armored). 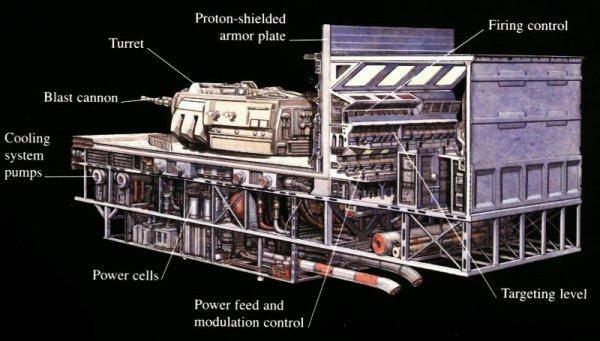 The heaviest weapons on board the Star Destroyer are the six turbolaser turrets positioned with the two heavy ion cannon turrets along the flanks of the upper deck structure. Fifty meters in diameter, these turbolasers can overload deflector shields and punch holes in the most heavily armored spacecraft. While smaller, fast-moving ships are difficult to target with the turret guns, even a glancing hit from these cannons will destroy them. This implies that these heavy cannons are many times more powerful than the smaller cannons, such as the turrets seen on the Death Star. This description is in reference to ISD-I subclass. The ISD-II subclass also has 8 turrets of 50 meters in diameter, but they contain 8 smaller barrels each (still larger than barrels seen elsewhere). See Turbolaser Cannons page for more information about these large turrets. 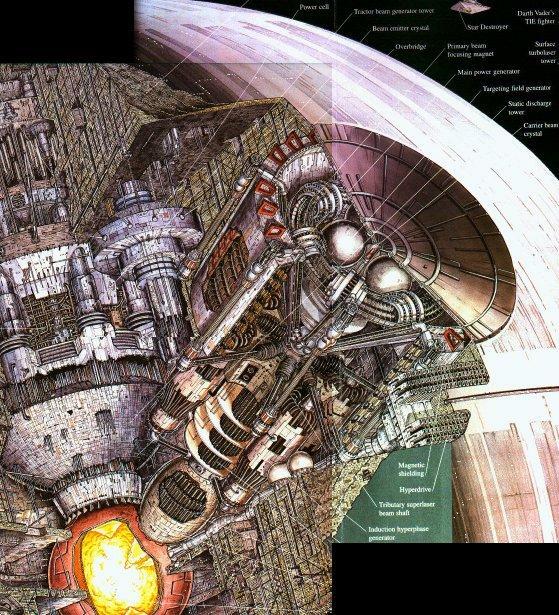 Cutaway drawing of ISD-I, showing large TL turrets, as well as large "quad-laser battery"
Anyone wonder why I say TL cannons fire at least once every two seconds? 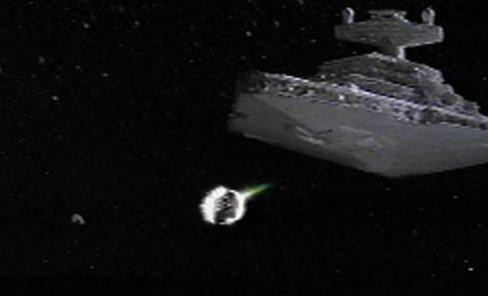 In the opening scene of A New Hope, the ISD fires many times on the Tantive IV. The scene changes from a ventral view of the ISD, to a view from the front. 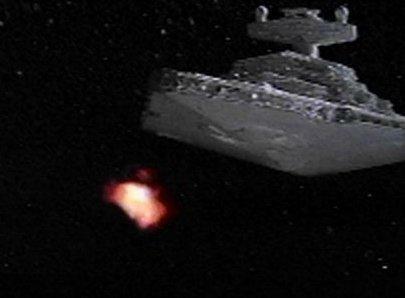 After the scene changes to the front view, the ISD fires with what appears to be only 6 cannons. I count 24 individual turbolaser bolts fired by these cannons in approximately 5 seconds. Thus, the cannons average 4 shots apiece in 5 seconds. The firing rate is thus almost once per second. The rate is actually even higher, since one of the cannons only fired once. The other cannons had to fire even quicker. But, given the density of weapons placement on ISDs (despite what WEG says), it is difficult to be certain that there were only 6 cannons firing, and I prefer to be precise, but conservative. Thus, I use once per 2 seconds in my calculations, because the rate is actually higher in light and medium cannons. 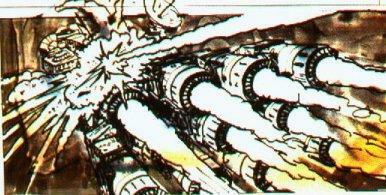 It is also difficult to be certain what size cannon is firing. Light cannons would likely have a high firing rate that medium cannons. In any event, the medium cannons defending the Death Star fire at least once per second at X-Wings. Many official (non-canon) sources state that a single ISD has sufficient firepower to reduce the surface of a planet to "slag". (note from MW: although the word "slag" is often used as a slang term, its real definition comes from materials science. The term comes from ore refining: metallic ores are melted down in a huge furnace, where the refined metals and impurities are separated under enormous temperatures. The refined metals are taken away, and the molten waste is known as "slag". If we are to take the term "slag" literally, then this would mean that an ISD can subject a planet's entire surface to the temperatures and pressures present in an ore refining blast furnace, for sufficient duration to dissociate the elements in the surface rock and allow the oxides, nitrides etc. to float to the surface of the resulting molten mass. This would mean that the effect must extend down to the level at which metallic ores are found, so all oceans and surface layers of soil would have to be vapourized first. Therefore, the energy requirement to actually "slag" the surface of a planet would actually be orders of magnitude greater than the ultra-conservative figures calculated here, or on my own site). If we assume a typical habitable planet, a lower limit on the power of the ISD's complement of TLs can be established. Curtis Saxton finds that melting the surface of a planet to a depth of 1 meter will require a sustained bombardment with power levels around half a billion Terawatts (ie- the ISD must sustain half-a-billion TW during the entire bombardment). The ISD would possibly be melting deeper than 1 meter worldwide, so the actual figure may be much higher than this. 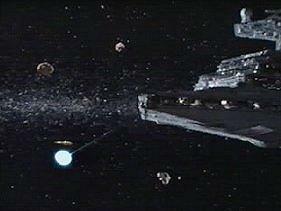 This can also be considered the level of firepower an enemy vessel would encounter in combat against an ISD. Of course, ISDs carry missiles which would be used in such a bombardment, but TLs are considered the primary weapon. Therefore, the figure is on the correct order of magnitude, especially since it was based on depths of only one meter. If ISDs carry 200 Turbolasers (as suggested by blueprints), then they must average around 2.5 million terawatts of sustained firepower per cannon. Of course, there are different sized cannons, some releasing less power than this, and some more. This power output is comperable to the detonation of a 595 Megaton nuclear bomb every second (per cannon). For comparison, the most powerful bomb detonated to date was rated at 50 Megatons. The common belief is that ISDs carry 60 turbolasers. This is very conservative, since 64 cannons are mounted immediately lateral to the command superstructure alone, with scores covering the rest of the hull. However, if we assume there are only 60 cannons, then they must average around 8 million terawatts of firepower each. This is comperable to the detonation of a 1900 Megaton nuclear bomb every second. 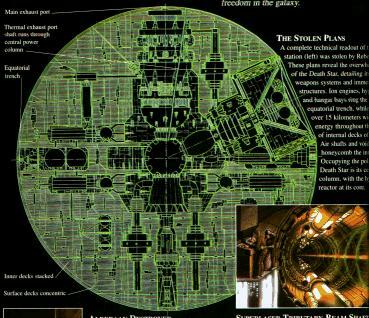 Blueprint specifications that imply 200 TL cannons on an ISD. Note that the size of the vessel was increased in the film. The laser cannons being mounted into the open skeletal frames required bracing and recoil-dissipation casings that would have withstood explosions measured in the giga-tonnage range. Anything less, and a single shot fired in battle would rip a destroyer or battle cruiser in two, a victim of its own lethal strength. This implies that the energy release from a turbolaser cannon is comparable to the detonation of a bomb with a yield of at least one gigaton (one thousand megatons). This translates to >4.186E18 joules. This is almost twice the estimate presented above (in relation to Base Delta Zero operations performed by 200 cannons). This is acceptable, since the estimate presented above for melting a planet's surface is very conservative, perhaps by an order of magnitude (this reference was provided by Ethan Platten). This is just the energy required to destroy the planet, with the fragments being ejected at escape velocity, which would take hours to complete. Alderaan was destroyed in seconds, so the power level of the weapon is much greater than Mr. Saxton's estimated lower limit. A possibility also exists that the Death Star was not firing at maximum power. Nevertheless, even the low 2.4E32 joule lower limit is approximately 522600 times the power output of Earth's sun! Mr. Saxton also calculated an upper limit on the firepower of this weapon, assuming it was set at maximum power. Using this upper limit of 2.4E38 joules, and the suggestion by official sources that the weapon required 1 day to recharge, Michael Wong calculated that the Death Star has a power output of 3 million times that of Earth's sun! He also calculated that a single blast from this weapon releases as much energy as Earth's sun does in 7,000 years! There is no way the Death Star could produce this much power using fusion, or even antimatter power sources. It would quickly consume enough antimatter to equal it's own mass. 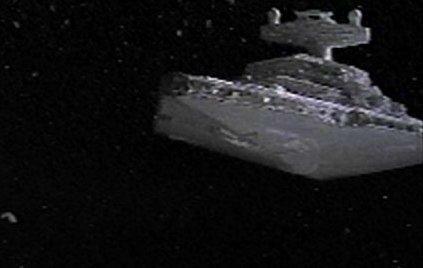 The Official STAR WARS Website states that the Death Star uses a "hypermatter" reactor. This is unfamiliar to modern science, but is responsible for the high power production of the DS. Unfortunately, we have no idea what "hypermatter" might be, so we must be content to simply quantify the Death Star's observed capabilities and leave its power generation method a mystery, albeit a mystery with a name. Michael Wong has presented possible power levels for fighter weapons. He states that in A New Hope, when Luke fired on the Death Star's surface, and superheated matter engulfed his ship, we gained a means to establish a possible lower limit on the firepower of those weapons. 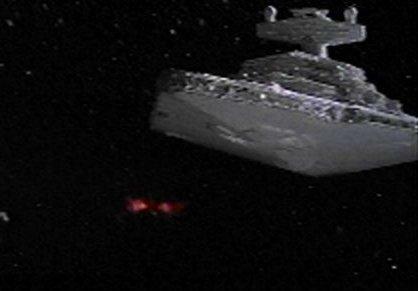 Since armor is not flammable and Luke's X-wing was nearly "cooked" by the heat, he states that the weapons must have been vaporising sections of the Death Star hull, causing the flash of expanding gases. He states that, to cause flashes that large, the weapons must have vaporised at least one cubic meter of armor. If so, and we assume that the Death Star is made of iron; the four X-Wing cannons output approximately 60 GJ of energy. 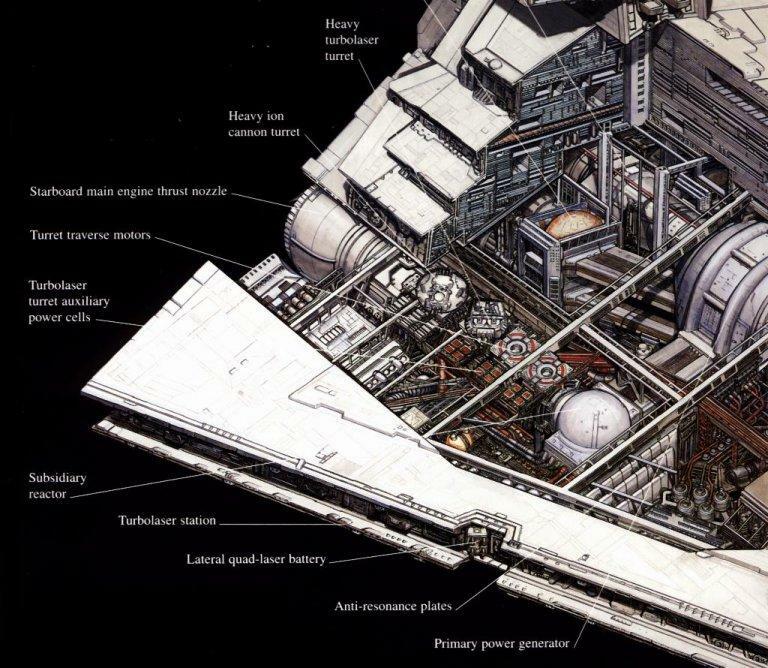 The Death Star is surely made from more heat-resistant materials than iron, so the calculations are conservative. If we assume that the bolt strikes a target for 1/10 second, each cannon directs 600 GW to a target. Since this estimate is conservative, an X-Wing's blaster cannons easily release more energy in 10 seconds than the entire United States produces in electrical power. This is especially impressive when one considers the number of nuclear power plants in operation in the United States. Mr. Wong has also calculated the intensity of a star's corona for comparison with a TL bolt. He states that a star's corona extends "millions of kilometers" from the surface. At a range of 1 million km from the surface of the star (deep within the corona) the energy output is approximately 10.5 MW/m². This is because the sun's power output (3.827E26 watts) is released in all directions. An object only absorbs a small fraction of this energy, depending on the distance from the star. Therefore, a 450 TW (my most conservative estimate) TL bolt is two orders of magnitude more intense than the corona of a star. All of these estimates are based on Earth's star, right here in the Solar System. 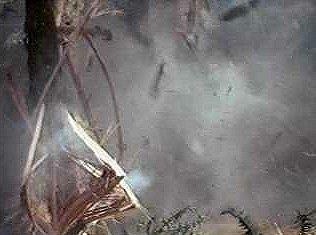 In Return of the Jedi, at least 2 trees are seen being hit by blaster bolts. 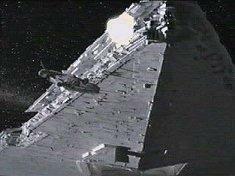 They are probably between the Imperials and the Rebels, and were destroyed to expose the targets more easily. These bolts were probably from the weapons on a Scout Walker, but possibly from a personal blaster. Given the angle of the bolts' approach, it is more likely that they were fired from the former. The smaller of these trees was literally cut into 2 pieces, and another lost a large section of its trunk close to the ground. It is difficult to assess the power of these blaster bolts accurately, because of uncertainties in the size of the trees and the properties of the wood in question. It is difficult to determine the properties of one particular type of wood due to variations in each sample. The wood on a moon in another galaxy may exhibit much different properties altogether. However, all wood contains a large percentage of moisture. Living trees contain much more moisture than wood that has been cut and dried for some time. The water content sometimes even exceeds the amount of solid material by mass. The surface of Endor (at least in the area the battle took place) must have had a good supply of rain and moisture for plant life to grow, as exhibited in the thick undergrowth. The trees probably had around 50-70% water content. Michael Wong theorizes that the water inside the tree was vaporised (turning the water into steam). The water vapor caused enough stress from expansion to exceed the tensile strength of the wood, causing the center portion to "blow out" through the outer shell of the tree. He refers to this as "hoop stress" (note from MW: this is exactly what happens when lightning strikes a tree; the water in the tree is almost instantly vapourized, and the resulting expansion stress splits the tree open. However, lightning tends to cause a trunk to split in half because it vapourizes water throughout its entire length, while a blaster bolt vapourizes the water only in a small section where it strikes the tree, hence the localized rupture). The size of the trees is difficult to determine. However, if we assume (subjective) that the larger tree's trunk was 15 cm (6 inches) in diameter, the affected section was 1/2 meter in height, and average tensile strength of wood, approximately 2 megajoules of energy were injected into the tree. The bolt's duration was approximately 1/15 second, so the bolt had approximately 30 megawatts of firepower. This is comparable to a pound of TNT, a small artillery shell, or 506 hunting rifles (30.06 with 180 grain bullet) fired simultaneously. These calculations are based on several assumptions, but do represent the actual firepower within an order of magnitude. 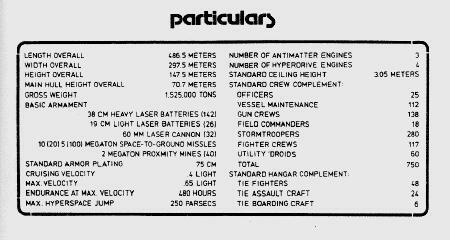 These are anti-personnel weapons, and are much less powerful than those aboard starfighters or larger walkers, and may not have been set at maximum power. They are several orders of magnitude less powerful than capital ship turbolasers. In A New Hope, Han exchanged blaster fire with a group of stormtroopers. 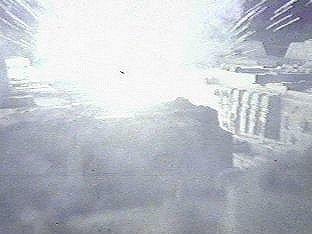 During this firefight, Han's blaster caused damage to the landing bay walls. The materials used in the building of these walls is unknown, so this is not a reliable source to determine blaster firepower. However, since spacecraft take-off and land from this area, it is likely that the walls are very heat-resistant. In this scene, the walls are seen glowing red-hot, and exploding.